I cannot believe we finally are on holidays, after 18 months of really hard work developing both Cairns Unlimited and Cairns Digital. But we somehow managed to leave everything on Danny and Anna’s hands. Thanks a lot guys for helping us!!! Danny and Anna, and of course gorgeous Will and little princess Chloe spent a few days with us before we left for our trip. Lot of last minute stress, many hours playing in the swimming pool and a handful of laughs made our farewell to Australia for 2008. 2009 is just around the corner and I’m sure it will make lots of other blogs. And then Monday came and it was time to embark on our trip to Spain. 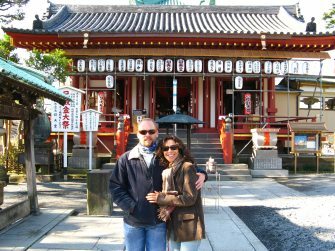 But not without spending a couple of days in Japan, a country Steve knew but I’d never been to. 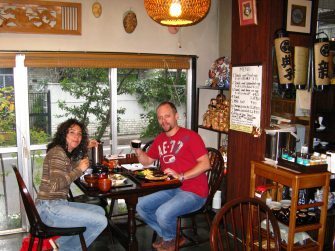 Before getting to Tokyo I just wanted to get to Madrid as soon as possible, skipping any stop along the way, but now I’m so glad we had a day there… We stayed in a wonderful Ryokan, a traditional Japanese guesthouse, Sawanoya, run by a fantastic Japanese family. Thanks to Steve we had a traditional room, with tatamis as beds. I must admit that I prefer the Western style to sleep but the room looked beautiful. 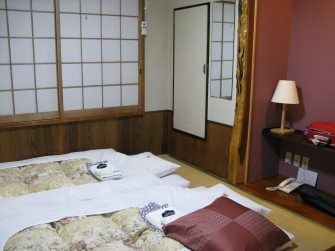 And you should have seen the two Japanese baths they had at this guesthouse. Absolutely beautiful. The first night we got to Japan pretty late, so we only had time to have something to eat and a quick drink. We found this little place in a corner and we decided to give it try. Steve loved his dish but I wasn’t so sure about the meat, although the rice was great. And then we found this tiny place in one of the back streets with a Guiness sign, a good omen when all you want is a beer. There was only one patron and two bartenders, one of which was the owner. I guess they don’t serve too many westeners and we have a bit of attention. They were all fantastic and everyone had a laugh, sometimes at our own expense, but we enjoyed being teased as much as they did. We won’t tell you much else about it so we don’t spoil the fun for them. All we can say is that the name of the bar is 35, close to Sawanoya Guesthouse. Totally recommended. Hi guys, you made us had a great time in Tokyo. Next morning we got up early and decided to go out and explore the city as much as can be done in just one day. Steve knew a bit about which of the areas were interesting, so I let him more or less organise the day. 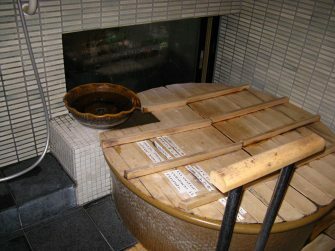 But before we went on exploring anything at all, we decided to enjoy a traditional Japanese bath. Basically, there’s a type of pond filled with steaming hot water. You first have a shower and then relax in the pond for a few minutes. Impossible to stay inside any longer, it’s really hot and we didn’t want to relax too much as we had a very busy day ahead of us. First we walked around our neighbourhood, looking for a place to have something to eat. It took us a while, because it was too early for many of the bars or restaurants to be open. But we finally found one. We only had to say that we wanted breakfast for the owner to take control of the situation. Green tea and a fried egg with salad, toasts and some type of ham. It was really nice and helped us recover a bit from the cold. Don’t forget we’re now Southerners and when the rest of the world is cold and shivering, that’s when we enjoy our summer. Although there’s not much difference between summer and winter in tropical Cairns. And the day before this trip we spent it at the swimming pool with the kids, fighting the heat. What a shock was for us to feel cold again. But I must admit it was pretty nice to be able to wear winter clothes again. After the whole morning walking around Ueno, where we were located, with its crazy atmosphere, with cars and people everywhere, we took the metro to Shinjuku, one of the most crowded areas in Tokyo. And if we thought that ueno was crazy, Shinjuku was even crazier, with lots of signs advertising businesses, videos in massive screens in the streets and lots and lots of people. One of the things that surprised me most was the smoking is prohibited in the streets and the council has installed smoking areas for smokers to congregate and don’t contaminate the rest of the passers by. A very good idea indeed. Somehow, walking around this neighbourhood we ended up in the red district, but not your typical one, but one only for ladies. About time we were also taken into consideration, isn’t it? The unusual thing is that all the “bars” aimed at ladies had the photos of their staff at the entrance, so you could choose which one was your favourite. Very thoughtfull indeed, so you don’t walk into a bar without knowing what you are going to find. I wasn’t really keen on any of the men “advertised”, with their funky clothes and their crazy hairdos. No, we didn’t go to the red district on purpose, we were trying to find somewhere cheap to have something to eat, but it was worth it. We finally found this little place somewhere in Tokyo. 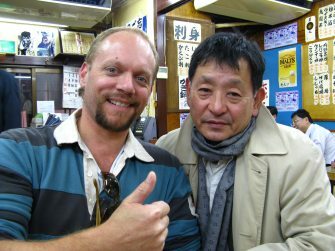 Of course, the owners didn’t speak English and we spoke even less Japanese, so we were back to hand signals and pointing to food some other clients were having. What we had was delicious, noodle and vegetable and fish soup for me and pork dumplings for Steve. As you can imagine, we couldn’t find anything real cheap, but that’s Tokyo, isn’t it? However, it was great to feel warm again and keep on discovering the city. From Shinjuku we walked all the way to Ikebukuru, about four kilometres walk. And by the time we got there, we were extenuated. It was only four o’clock in the afternoon, and we felt like a beer. Mission impossible to find a bar serving beer at that time of the day. We had to wait for at least another hour, and those of you who know Steve will realise that patience is not one of his virtues. So we walked and walked and walked until we settled on a cafeteria. So we walked in and then he decided to have a coffee instead of a beer. Men!!! Will you believe us if we tell you that we spent $20 on a coffee and a tea? Lucky we only had a day here…. And after walking around for a while afterwards, discovering a few other hidden streets, seeing some women wearing their beautiful kimonos, etc, we found the most amazing bar. All the walls were covered in Japanese writing, with tatamis on the floor and a few other tables scattered around. There was a large group of Japanese business men smoking like chimneys and pissed like barrels. So we walked in. At first we were eyed a bit suspiciously and we thought I wasn’t welcome. Maybe I wasn’t but we still sat at one of the tables and ordered. Soon after we arrived, the business men decided to call it a night. But one of them, whom we thought was the boss, stayed behind for a while, while the rest waited for him outside. He finally left, but came back a couple of times, each time making it a bit closer to us, until he finally sat down at our table. His English was reduced to ten words, more or less like Steve’s Japanese. So every atempt to communicate was fruitless. However, we still sat together for a long while, trying to understand each other. He then produced a couple of sweets for us, and when he saw we liked them, he started giving us everything he had in his bag: two mandarines, one toothpaste, two hand painted little balls… He was absolutely fantastic and he, and all the staff, had a great time. Thanks a lot!!! And then it was nearly time for dinner so we decided to find a sushi place near our neighbourhood. Absolutely impossible, all of them were already closed and the one we found which was open would let us come in because they were busy. But they had only three people sitting at the bar!!!!! Anyway, we found another place and although we couldn’t eat sushi, our food was again delectable. 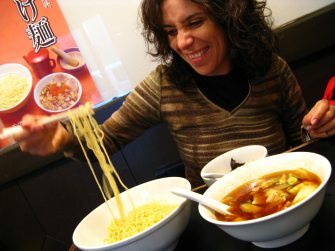 I’d love to spend more time in Japan if only for the food. The next morning it was time to pack and go to the airport again. Arriving in Spain was getting closer and closer. And after many more hours on a plane, we finally made it. All my family was waiting at the airport: parents, sister, uncles, boyfriends… It was amazing to see them all again. Finally, I’m a Certified Diver!!! Yes, I finally managed to have some time off to obtain my PADI Open Water Certification. After I did my two intro dives with Down Under Dive two weeks ago, it was in my mind wanted to become a certified diver so I could join some of my Aussie friends in their diving expeditions. It’a a shame I haven’t been able to convince Steve to scuba dive with me, so I had to do it on my own. Well, too bad for him!!! 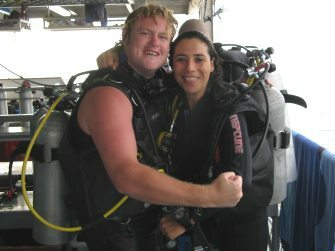 I did the course with Deep Sea Divers Den and they were kind enough to let me do it over two consecutive weekends. The first two days were in the class and swimming pool, learning the theory and a few skills that we had to practise before going to the sea. And the second weekend we went to the Great Barrier Reef to practice those skills in the ocean and obtain our title. We left early on Friday morning, of course after delivering a few of our wonderful Cairns Digital Underwater Cameras. The first part of the day we spent on their day boat, having two different opportunities to dive. Apart from practising the skills, ie. how to breathe if your regulator falls off your mouth, what to do if you run out of air (scary, isn’t it? 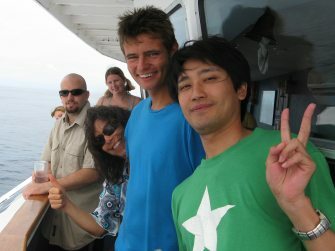 ), etc, Pete, our instructor, took us for a fun dive as well. We saw lots of different corals and fish, including a Trigger Fish. They can be kind of dangerous if they feel threatened and their bite is painful. So we kept away from them as much as we could. And just as we were reaching the boat we spotted a turtle, slowly swimming around the divers, disappearing in the distance and coming back a few minutes later. Absolutely wonderful. In the afternoon we were transferred to the overnight boat, where I was sharing a double room with another diver. The boat is really nice, with lots of room for everyone to feel comfortable. While they gave us a short briefing about what we were going to do for the next day, we were eating delicious freshly baked home made muffins, in fact, they were still warm. And five minutes to unpack because we were back in the water again. The second reef for the day was Norman Reef. Again a bit of training and a leisure dive. By this time we were all feeling much more comfortable in our diving gear. You could tell by us not using our arms and hands as much as in previous dives. Being underwater is a funny feeling, wonderful, though. It’s as if I was in the space, with no gravity and being able to move whichever way I want. And after that dive, time for a shower and relax before dinner. Delicious lasagna and fabulous apple crumble, which I ate lots of and couldn’t move afterwards. Lucky my dives for the day were finished, otherwise I would have sunk straight away. After dinner everyone on the boat got together for a few drinks and a bit of entertainment. The staff were multitasking, and the chef and the skipper were keeping us all entertained playing music and singing. I miss Spanish music, mostly because I cannot sing most of the songs they sing. The alarm went off at 5.30am, so we could get ready for our final dive before we were certified. Early, isn’t it? But it was really nice to jump into the cool water, it was pretty hot outside already. And that was the end of our training, now I’m a certified diver and won’t need to pay someone to take me around every time I want to dive. What a feeling… I’ve discovered a passion for diving which I wished Steve shared with me, but that’s life. Although I don’t know how he’s going to take me going on liveaboards now and then. Only one night away and my inbox was full of messages telling me he missed me because he had nobody to laugh at his jokes. He’s always been appreciative of an audience. But it was the last dive we’ll remember most. Already without a guide, we wandered off on our own. We knew the current to be strong, so tried to swim against it. We did for a while, but as we got more and more tired we just wouldn’t move and, worst of all, our air was getting low. We went to the surface and tried to reach the boat, which seemed far away. Ten minutes swimming and we were just as far. Ashamed, we signalled the boat to be picked up and they came rapidly. We were to hang on to some ropes and they would tow us back to the boat. But then the boat spotted someone in distress and had to go and rescue them first. Knowing that we were going to be transported to the boat, we let ourselves go and drifted for many metres. But luckily we were rescued, along with many other people, and that was the end of our little adventure. 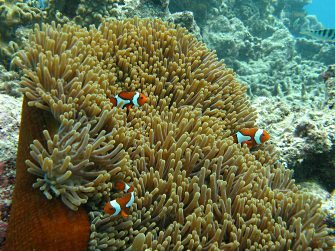 You are currently browsing the Our life in Tropical North Queensland blog archives for December, 2008.